From the World Dairy Expo’s Dairy Product Contest in Madison, Wis., at the beginning of October to Anuga 2017 in Cologne, Germany, and then to Chicago (nice season Cubbies, til next year!) for this week’s NACS 2017, the exposition of the National Association of Convenience Stores, cheese has been getting lots of attention. Artisan cheesemakers, regional creameries and global brands are showing the industry that cheese, a simple, clean-label, natural food that starts with four ingredients—milk, cultures, enzymes and salt—can be enjoyed as a snack, an on-the-go mini meal, an entrée and as dessert. Let’s explore some recent entries to the global cheese case. But first, congrats to Sartori Company, for its Grand Championship winner at the World Dairy Expo. 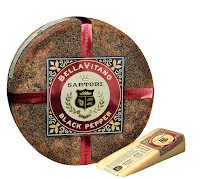 The Plymouth, Wis.-based cheesemaker took home the high honor for its Black Pepper BellaVitano Cheese. Link HERE for more information on Word Dairy Expo and the contest. At Anuga 2017, a biennial fair that is the world’s largest food exposition for the retail trade and the foodservice and catering markets, cheese dominated the dairy hall, which is one of 10 expositions within the overall Anuga show. 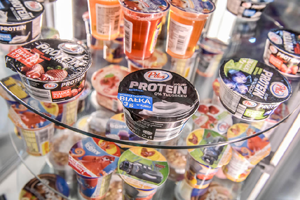 To read last week’s blog on Cultured Dairy Product Trends from Anuga, link HERE. This 34th Anuga was impressive and a record setter. More than 7,400 companies from 107 countries presented products from all over the world and all categories over the course of five days. Around 165,000 trade visitors from 198 countries took advantage of this unique offer for sourcing, information and ordering at top level. 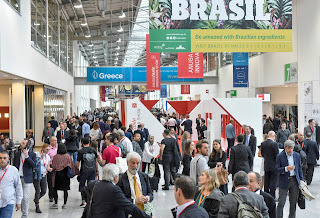 To read an overview of the entire Anuga expo, including a slideshow of some amazing innovations, link HERE to an article I just wrote for Food Business News. The Anuga taste Innovation Show competition is part of the exposition. Nearly 900 companies placed more than 2,300 products in the new products database on the Anuga website for consideration for the taste recognition. In total, the jury selected 67 products and concepts. 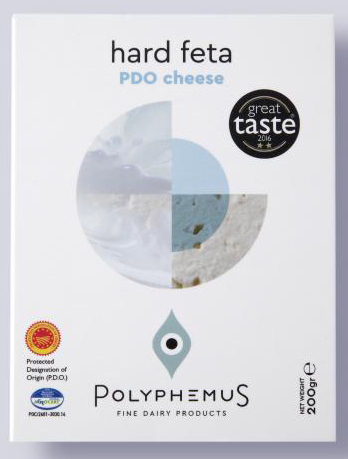 This includes Hard Feta from Polyphemus Fine Dairy Products, which is Greek feta cheese p.d.o. (protected designation of origin) with a maximum moisture content of only 50%. The reduction of moisture lends this feta cheese a strong taste and a harder, more crumbly texture. This cheese benefits from an additional maturing time (at least 4 months), which allows its proteins to decompose into short-chain proteins and peptides for extra taste and aroma. Lustenberger & Dürst SA in Switzerland received the Anuga taste Innovation Show accolades for its convenient LeSuperbe Swiss Raclette Gourmet Baking Tray product. 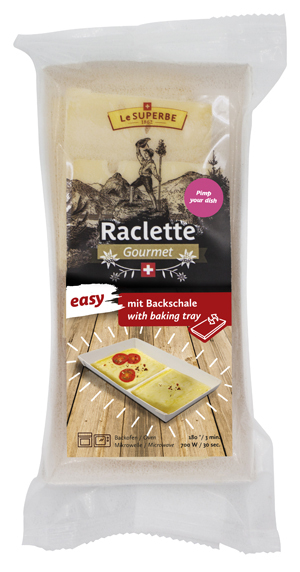 The packaged Swiss raclette cheese comes with a baking tray that makes it possible to prepare slices of raclette directly in the oven without an additional tin. The consumer does not need a classic raclette oven or any other baking tray. It can simply be prepared directly in this innovative box. Furthermore, the raclette slices can also be directly melted in the microwave. After preparation, the baking tray can be lifted out of the oven or the microwave with the hand because the box does not gets hot. 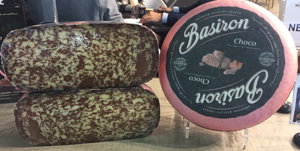 Other innovations spotted on the show floor include Basiron Choco, which combines two foodie favorites: cheese and chocolate. The limited-edition cheese from Veldhuyzen, The Netherlands, will be available starting mid-November, just in time for the holidays. The large waxed rounds are designed for in-store cutting. 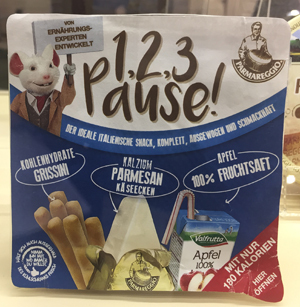 Also perfect timing for the holidays, Germany’s Bayernland offers Mozzarella Wraps. For retail, the wraps come as individual 130-gram sheets of mozzarella. The user simple fills, rolls, slices and enjoys. For foodservice, resealable tubs contain eight wraps sitting in brine. The Netherland’s Vandersterre Holland B.V., makers of the popular Prima Donna line of cheeses, is rolling out Jersey Gouda under its Landana label. 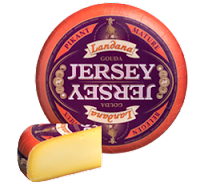 Made from the milk of Holland-reared Jersey cows, the company describes the gouda as “different cow, different milk, better cheese.” There are two varieties. Mild is aged for about eight weeks, while Mature is aged for about 17 weeks for a fuller, richer flavor and body. Also new under the Landana brand is Smokey Hot Pepper, which is traditional Dutch cheese with smoked jalapeno peppers for an interesting kick. Germany’s Alpenhain now offers a convenient, spreadable form of camembert. 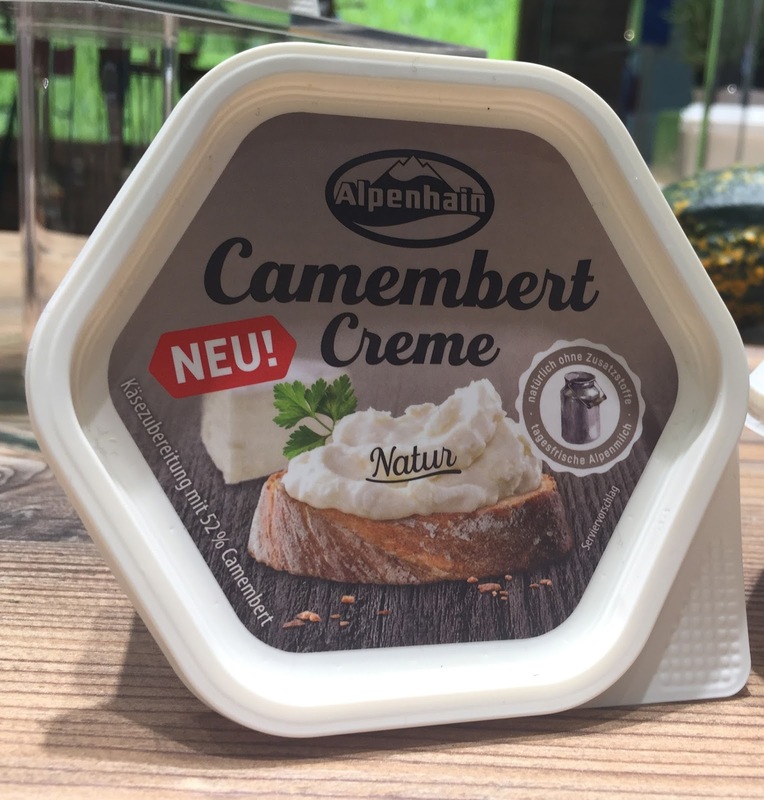 New Camembert Crème come in natural and chive varieties. The cheese is made using fresh local Alpine milk without added flavor enhancers, preservatives, colors, emulsifying salts or thickening agents. It can be used as a bread or crackers spread, alone or with jam or honey, or as a cooking tool in everything from sauces to stuffed chicken breast. 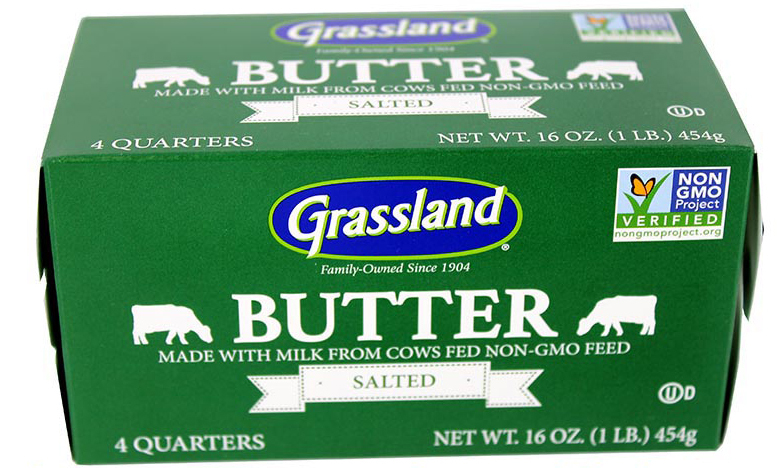 The spread comes in 125-gram containers for retail. For foodservice, chefs can work with 1.5 kilogram tubs or offer guests 25-gram portion packs. After launching a corporate realignment this spring, the DMK Group of Germany used Anuga to roll out an integrated range of products. 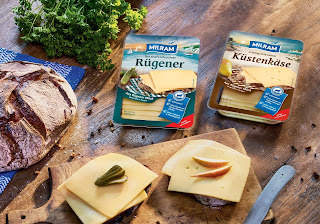 New Milram cheese varieties include Rügener and Küstenkäse in slice format. This convenient form brings the flavors of northern Germany to the nation’s sandwiches. These two cheese originals, made of milk from the island of Rügen, owe their particularly intense flavor to the red smear cultures used in their production. 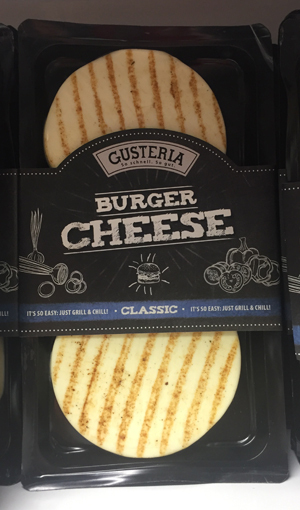 Austria’s Concept Fresh continues to grow its no-melt cheese sold under the Gusteria brand. The most recent introduction is Burger, which are patties sized for bun. This joins the brand’s snacking size that rolled out two years ago. Both the burgers and the snacking medallions come with grill marks, so that they can be easily microwaved and served. The burger made its debut in the Classic flavor. The snacks come in three flavors: Chili-Paprika, Classic and Herbs. M.J. Dairies of Bulgaria showcased an innovative kids’ cheese snack. 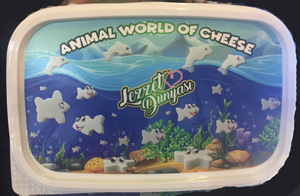 The recloseable tub is designed to resemble a fish bowl, while the cheese snacks it contains come in the shapes of fish, dolphins and starfish. The cheese is vacuum packed inside the tub, with or without brine. 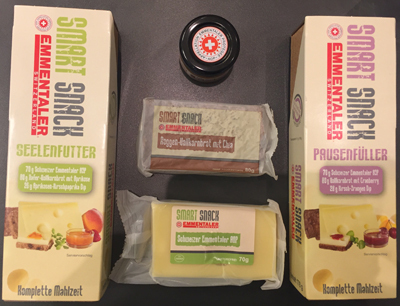 Switzerland Cheese Marketing is introducing Smart Snack. 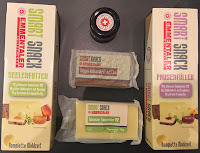 The branded snack is from and with Original Swiss Emmentaler AOP, a raw milk cheese made with cows milk from the valley of the Emme in the canton of Berne and made in the same region by local dairies. Each 178-gram upscale package contains two slices of the cheese (70 grams total), two slices of bread (80 grams total), a jar of spread (28 grams) and a knife. There are three varieties. Break Filler has whole meal bread with cranberries and cherry and orange spread. Life Saver has whole meal rye bread with chia seeds and a peppery pear and passion fruit spread. Soul Food has whole meal oat bread with apricots and apricot and pimiento spread. Because kids want their own fun snack products, Italy’s Parmareggio SPA is rolling out the ABC and 123 collections. These snack packs contain single-serve portions of parmesan cheese along with accompaniments such as breadsticks, crackers, muffin and even a juice box. Greece’s Alpha Gefsi Edesmata offers consumers a fun way to enjoy feta, which is as a dip and spread. Often mixed with Greek yogurt, or various herbs, spices or chopped vegetables, the product line recently had a makeover, with packaging now showing food photography and offering serving suggestions. Italy’s Granarolo Group is making ricotta cheese a convenient snacking product by making it available in single-serve cups. The product is also lactose free and marketed as a high-protein food. The company is also one of a number of Anuga exhibitors who introduced baked cheese snacks. 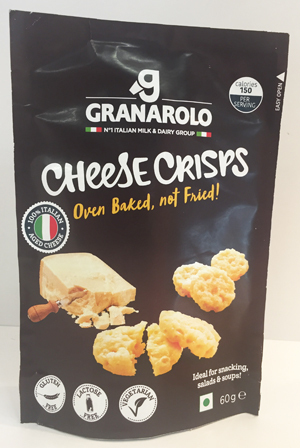 Granarolo Cheese Crisps are 100% Italian cheese snacks that are gluten, lactose and carbohydrate free. High in protein, the shelf-stable cheese snacks come in five varieties. They are: Black Olive, Classic, Onion, Paprika and Pizza. Such baked cheese snacks are gaining momentum throughout Europe, so much so, that non-dairies want a piece of the action. 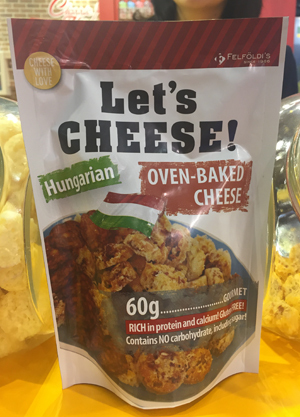 Hungary’s Felfoldi Confectionery Ltd., will be rolling out Let’s Cheese early next year. These 100% cheese oven-baked snacks are marketed as rich in protein and calcium. They come in range of varieties, including ethnic flavors such as Hungarian and Italian, as well as Hazelnut, Natural and Pork Rinds. 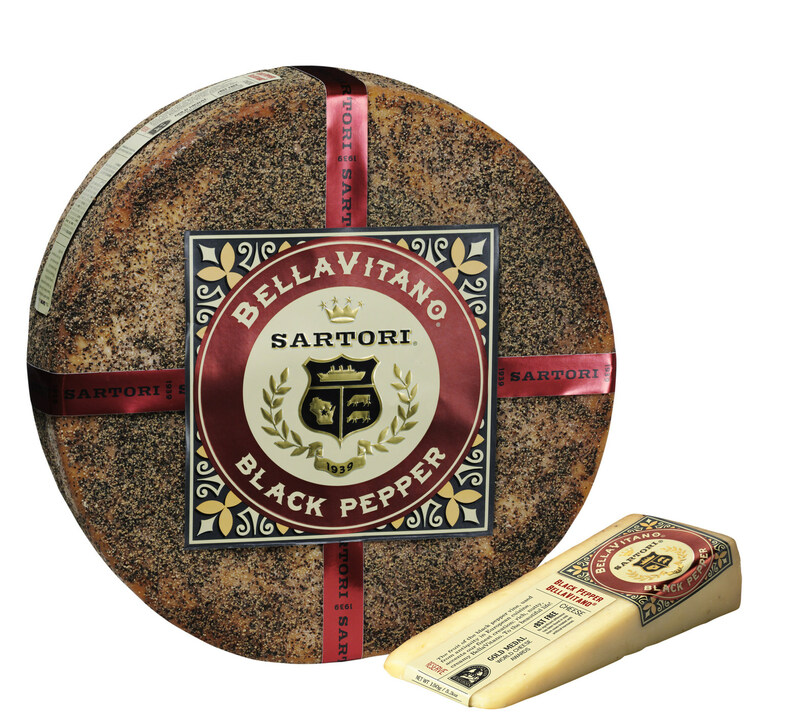 At the NACS show in Chicago, which ends today, Friday, October 20, Sargento, Plymouth, Wis., brings a flavorful twist to the familiar with a new and unique cheese snack. 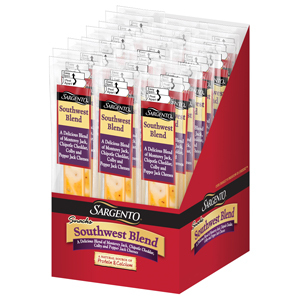 The Southwest Blend Snack Stick is natural cheese that blends the creaminess of Monterey Jack with Chipotle Cheddar, Colby and Pepper Jack cheeses. 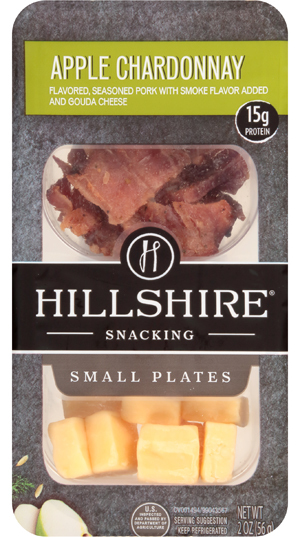 About a year ago, Tyson Foods Inc., Springdale, Ark., introduced the Hillshire Snacking brand, which includes an array of individually portioned protein snacks for an elevated on-the-go eating experience to satisfy a more sophisticated food palate. The line includes Hillshire Snacking Small Plates, with each offering containing 15 or more grams of protein per serving. The plates are combinations of meat (salami slices, spicy pork chunks or grilled chicken chunks), cheese, crackers, crisps and nuts. At NACS, the brand revealed it latest addition to the line. The new combinations come with alcohol flavor-infused meats. Varieties are: Apple Chardonnay, Smokey Bourbon and Whiskey & Brown Sugar. Chicago-based Kraft Heinz Co., is also grows its meat and cheese P3 (portable protein pack) snacking line. 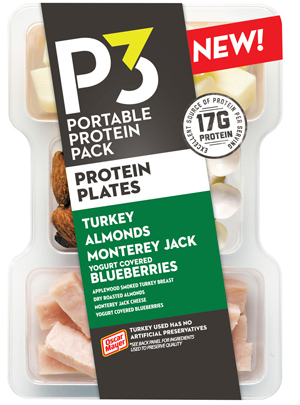 New P3 Protein Plates contain 60% more food than the original snacking size, according to the company. They are currently available in four varieties: Turkey, Cashews, Cheddar and Cranberries; Chicken, Almonds, Colby Jack and Blueberries; Ham, Cashews, Cheddar and Cranberries; and Turkey, Almonds, Monterey Jack and Blueberries. All P3 Protein Plates are designed to be shelved in the refrigerated section. Skyr was one of many cultured dairy product sensations in the spotlight at Anuga 2017, which was held this week in Cologne, Germany. This biennial food fair is the largest of its kind and has an entire exposition hall dedicated to dairy foods. While cheese dominated the hall, cultured dairy foods had a very strong presence. 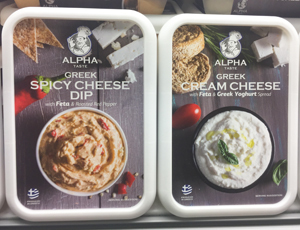 Greek yogurt maintained a healthy showing; however, many global processors, in efforts to be ahead of the game in terms of what might be the next Greek yogurt, showcased numerous other cultured dairy formats. Skyr was one of them. Skyr has been Iceland’s signature food for nearly a thousand years dating back to the 9th Century when it’s believed that Vikings brought skyr on their journeys. It has the consistency of strained Greek yogurt but is milder in flavor. It is high in protein, with traditional skyr made with nearly zero fat milk. In its traditional use it is diluted with water or milk and consumed as a beverage; however, modern-day skyr comes in a container and is consumed in a similar manner as yogurt. 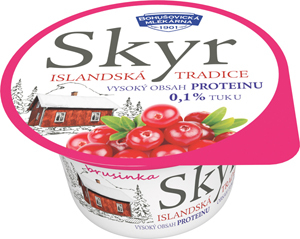 In the past few years, skyr has been gaining traction in Europe and North America. It’s poised to become a bigger deal going forward, as curious consumers are growing tired of Greek yogurt and are seeking out the next healthful dairy food. U.S. processors are taking note. For example, last month at Expo East in Baltimore, Maryland, Icelandic Provisions, which made its debut in the U.S. about 18 months ago, relaunched the line with a redesign and new flavors. The company’s initial rollout included five flavors: classic Plain and Vanilla, and three Nordic-derived varieties: Strawberry with Lingonberry, Blueberry with Bilberry, and Peach with Cloudberry. Soon after, Coconut, Key Lime and Raspberry were added. Cherry Black Currant will make its debut in January. The flavor was crafted in partnership with Chef Gunnar Gislason, one of Iceland’s most acclaimed chefs and a pioneer ushering in the Nordic food movement in the U.S.
Icelandic Provisions is made with preserved and treasured heirloom skyr cultures and local milk from cows on a largely grass-filled diet. Icelandic Provisions does not contain artificial preservatives, thickeners, sweeteners, flavors or colors. The company was co-founded with MS Iceland Dairies, the oldest and largest dairy co-op in Iceland, made up of approximately 600 native farms and milk producers. A group of industry veterans were assembled for the U.S. development and management team. The new flavor combines ripe black cherries with the tart punch of black currant, both of which are commonly found throughout the Nordics. When Chef Gunnar Gislason is not heading up the kitchen at Michelin-starred Agern in New York, he advises the brand on native Icelandic flavors and culture. Similar in health benefits to the rest of the portfolio, the new Cherry with Black Current flavor boasts 15 grams of protein and 1.5% milkfat, all while remaining naturally low in sugar. 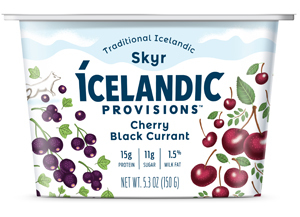 Icelandic Provisions can be found in the refrigerated section of more than 4,500 U.S. retail partners nationwide. Back to Anuga, Bohušovická mlékarna in the Czech Republic showcased its new “Islandska Tradice” (Icelandic Connection) line, describing the product as a high-protein alternative to yogurt and quark. Graphics showcase the quality fruits used in the product, and a Nordic snowcapped countryside gives a nod to the product’s origins. 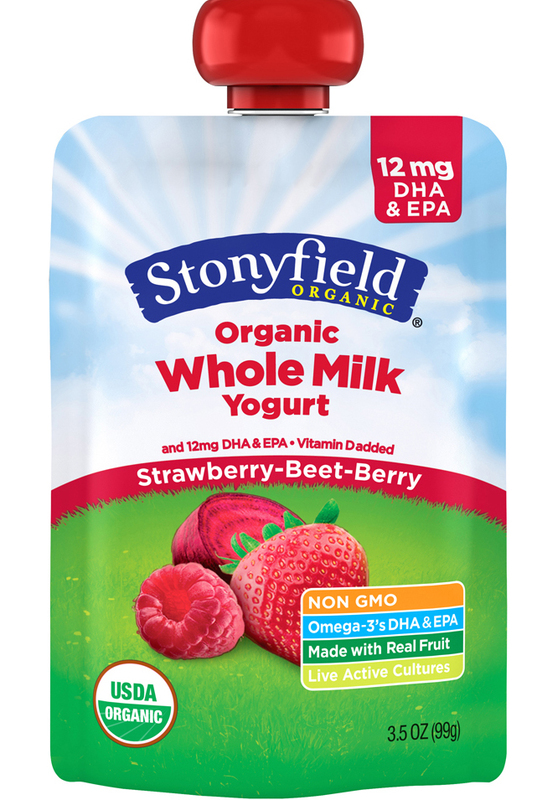 The single-serve 140-gram containers come in Blueberry, Cranberry, Natural, Peach/Apricot, Raspberry and Strawberry varieties. Natural is also available as a 350-gram family-size tub. The product is 12% protein and 0.1% fat. Ehrmann is entering the skyr category in its home country of Germany. 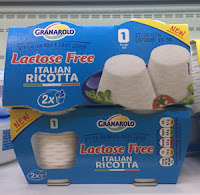 The initial line is 7.7% protein and fat-free and comes in single-serve cups. 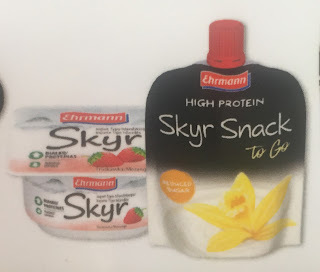 In the near future, the company will roll out the first Skyr Snack to-go pouches targeted to adults looking for a healthful, convenient high-protein snack. 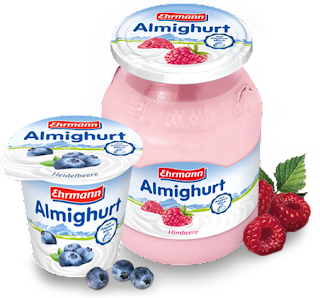 The company is also expanding its yogurt line and now offers 470-gram non-returnable glass bottles of whole milk yogurt under its Ehrmann Almighurt line. And, Tropical joins the company’s rather new yogurt drink line, which includes Mango, Raspberry, Strawberry and Wild Berries. Containing less than 1% fat, the clean-label drinkable yogurt beverages are positioned as an on-the-go snack. Watch for some additional high-protein cultured dairy foods and dairy snacks from Ehrmann to be featured as a Daily Dose of Dairy in upcoming weeks. 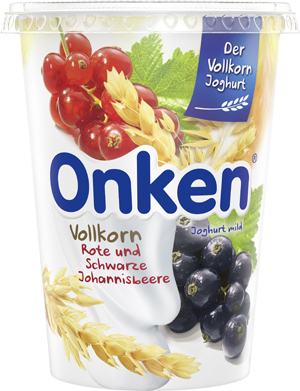 Also from Germany, Emmi is growing its Onken brand with a blended product based on whole grains, fruit and whole milk yogurt. Varieties are Cherry, Red & Black Currant, and Vanilla. The product comes in 500-gram cups and features the brand’s special whole grain mixture consisting of rye, barley, oat, wheat and rice. Koukakis Farm S.A. of Greece was an Anuga taste Innovation Show winner. Nearly 900 companies placed more than 2,300 products in the New Products Database on the Anuga website for consideration for the taste recognition. In total, the jury selected 67 products and concepts. Koukakis Farm received the accolade for its new stevia-sweetened kefir. This probiotic effervescent cultured dairy beverage comes in Blueberry, Sour Cherry and Strawberry flavors and is promoted for its ability to support digestion and overall health. 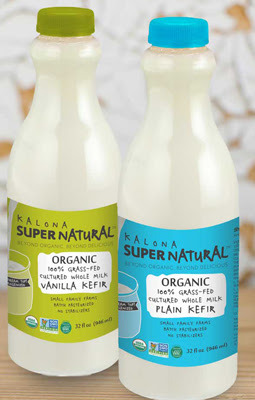 The fermented dairy beverage is made from fresh Greek milk and is rich in protein, vitamins and minerals. Another Anuga taste Innovation Show winner is Graham’s The Family Dairy in the United Kingdom. The company’s Protein 22, which is fresh, award-winning milk cultured into smooth, fruity quark, received the accolade. The product comes in Blueberry, Peach, Raspberry and Strawberry varieties. It’s fat free with natural fruit flavorings, and contains no preservatives or additives. With 22 grams of protein per pot, Protein 22 is eaten just like a yogurt and is great as a pre or post work out snack, helping to maintain and grow muscle mass. 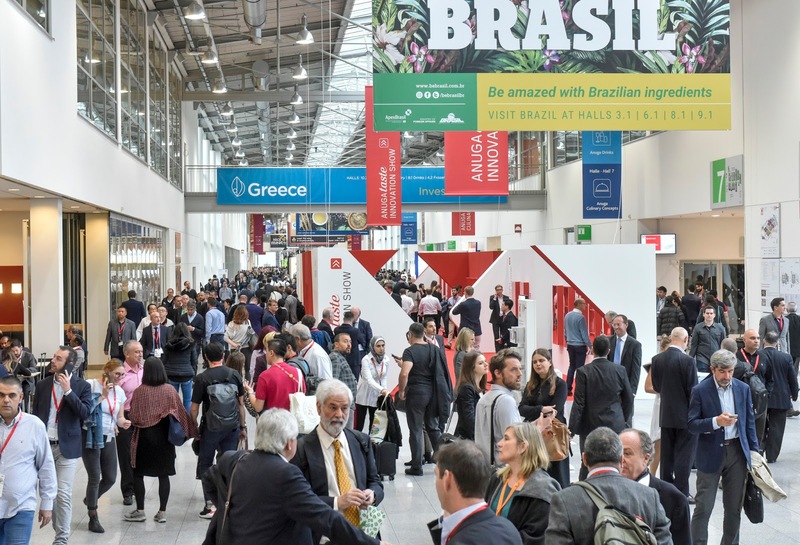 The Anuga taste Innovation Show program, along with Innova Market Insights analysts, identified numerous trends that will drive future innovation. As expected, protein was one of the recurring keywords among the new products. In addition to protein, less sugar and lactose free were repeated themes among many dairy product innovations. Clean label, too, dominated the discussion. Whether meat products, vegetarian/vegan products, complete meals, snacks or beverages, the array of products that contain an extra portion of protein is immense. There were a number of milk-coffee drinks enhanced with high-quality protein, some marketed as refuel and energize shots. Yogurt and curd products are now blatantly being positioned as mini meals that are rich in protein. Even ice cream marketers are designing products with added protein. For example, with its unique combination of protein and caffeine, Innoprax AG’s Caffè Lattesso Sport is promoted as the ideal power coffee for successful training sessions. S.A. Corman offers a Cream with Greek-Style Yogurt. It meets the demand for products that naturally pack more pleasure and new taste experiences with a lower calorie count. Emirates Industry for Camel now offers Camelicious Camel Milk Protein Bar, which takes all the health and goodness of camel milk and infuses it into a protein snack bar. Ehrmann GmbH offers Qjo in four different flavors. Qjo is claimed to be the ideal source of protein for everyone focusing on conscious nutrition and pleasure at the same time. 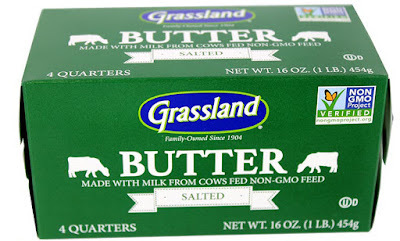 Look for many of these products featured as a Daily Dose of Dairy in coming weeks. The so-called superfoods--chia, aronia, acai, but also ginger, green tea, citrus fruits and guarana—were strongly represented at Anuga and round off many products in terms of taste and ingredients. In this way, many classics are being redefined, e.g., quark now with chia and flaxseed. Completely ready-made meals are nothing new, but the Anuga exhibitors showed new versions, clever packaging sizes and fresh formats. For instance, tomato/peach/apricot flavor vegetarian soups in a grab-and-go bottle and fully cooked chicken breasts in snack portion bar-style sizes. One dairy processor offered grill-ready burgers made completely from cheese. A new Swiss raclette format can be prepared in the oven or microwave in small portions. Indeed, this 34th Anuga was impressive and a record setter. More than 7,400 companies from 107 countries presented products from all over the world and all categories over the course of five days. Around 165,000 trade visitors from 198 countries took advantage of this unique offer for sourcing, information and ordering at top level. 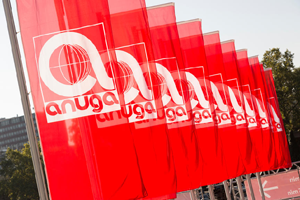 The next Anuga will take place October 5 to 9, 2019. Plan on attending. For more information, link HERE. At Health Ingredients Japan this past week, there were extensive discussions surrounding formulating foods for the aging population. Yogurt was identified as an attractive food to get pumped up with extra nutrition for smart aging. Let’s call this strong yogurt. The concept is simple. As we age, the body needs help to function at its best. That help may come from foods such as yogurt. According to a recent study published in the August 2017 issue of Osteoporosis International, greater yogurt consumption is associated with increased bone mineral density and physical function in older adults. Researchers correlated the intake of yogurt (any type) with bone mineral density in 4,300 older people in Ireland. 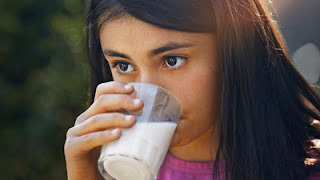 After adjusting for body weight, physical activity, overall diet quality and other factors related to bone health, the researchers found that each additional weekly serving of yogurt was associated with higher bone mineral density, and thus a reduced risk of osteopenia and osteoporosis. If you have not noticed, there are very few overweight elderly people. Although maintaining a healthy weight helps with longevity, too skinny, a.k.a. frail, can be weakening. This is why building strength as one ages is important. High-quality protein, such as that found in yogurt, is one of a number of strength-building nutrients. When combined with exercise, dietary protein helps reduce the risk of age-related muscle loss known as sarcopenia. 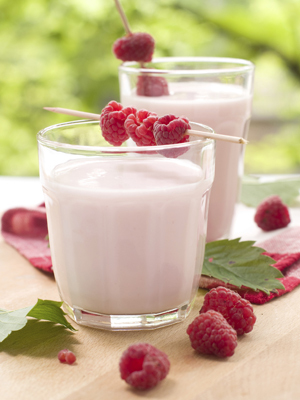 The active bacterial cultures, in particular those with probiotic functions, found in yogurt may also build strength. Some bacteria provide digestion benefits, while others boost immunity. Prebiotic fibers function as fuel for the probiotics. They also have their own positive impact on digestion. Some have been shown to improve absorption of calcium, further assisting with bone health. Some fibers, namely chicory root fiber, may also assist with sugar reduction. Sugar content is an attribute yogurt manufacturers cannot ignore, as sugar content of flavored and fruited yogurts continues to be highly criticized. 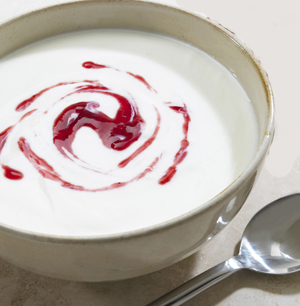 Clean-label reduction is important to maintain yogurt’s natural, simple, healthful halo. According to a study from the University of Surrey published on September 18, 2017, by Clinical Science, healthy people who consume high levels of sugar are at an increased risk of developing cardiovascular disease. The study found that a subject group of otherwise healthy men had increased levels of fat in their blood and fat stored in their liver after they had consumed a high-sugar diet. The researchers’ findings provide new evidence that consuming high amounts of sugar can alter fat metabolism in ways that could increase risk of cardiovascular disease. And while most adults don’t consume the high levels of sugar used in the study, some children and teenagers may reach these levels of sugar intake by over-consuming soft drinks and sweets, and yes, even some yogurts. These findings support the belief that too much sugar is not good for the body. 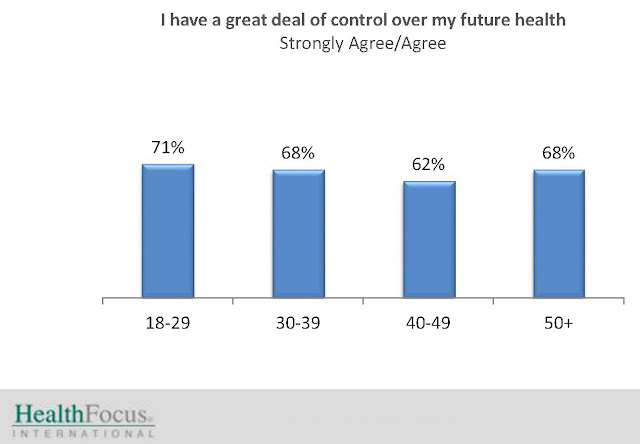 A decade or so ago, HealthFocus first identified a change in direction in how consumers perceive their personal health. 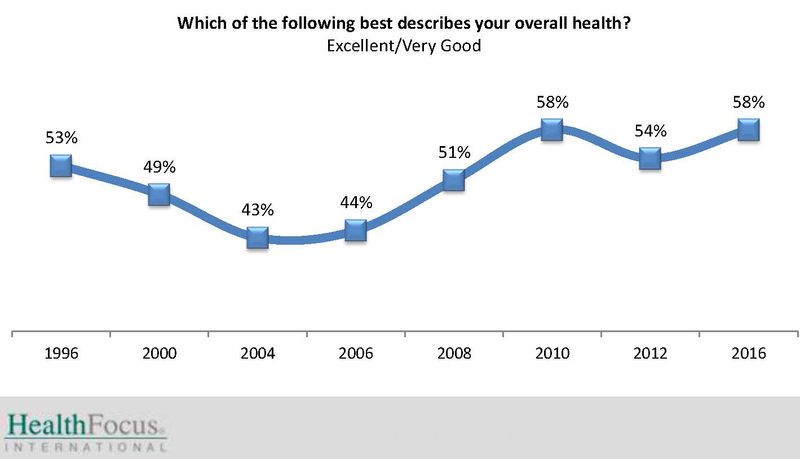 For many years prior, the percentage of the population that considered themselves in excellent/very good health was on a downward path. But beginning in 2006, HealthFocus saw this begin to reverse, and it continues to climb today. 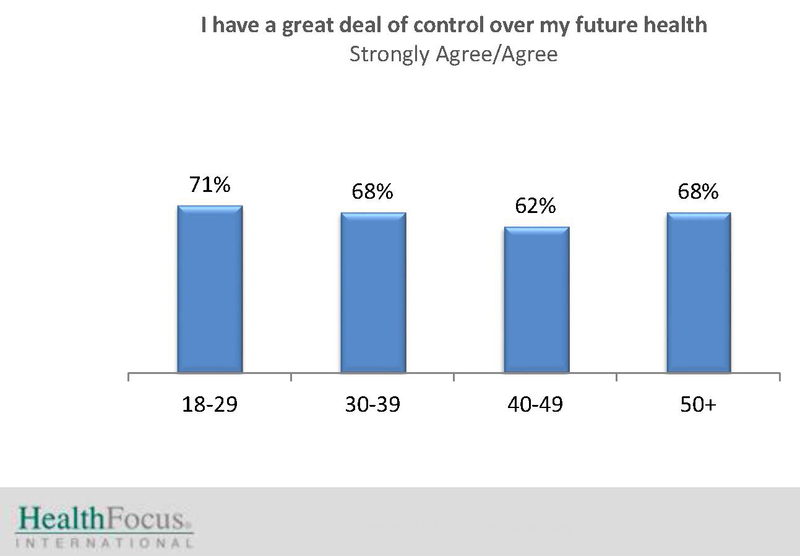 This higher self-evaluation of health reflects a shift in consumers’ confidence, a response to nutritional benefits and the beginning of recognizing the power—and strength—of total well-being and balance. 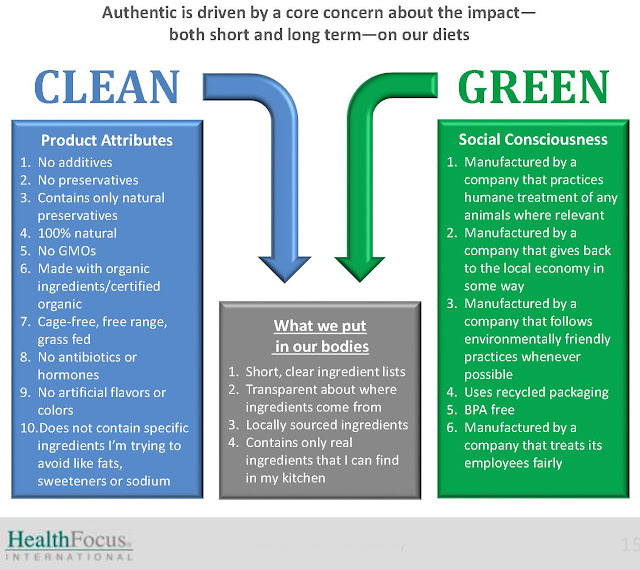 Less than five years ago, HealthFocus spoke aggressively about the emergence of protein as a more popular health-promoting nutrient, the darkening horizon for sweeteners and the formation of the eating clean revolution. Clean eating evolved from a growing consumer understanding that everything that goes into the body has implications, good and bad, short and long term. This includes the integral role of digestive health to total health and in building strength. Gut health was no longer about stomach-related problems or discomforts. More currently, HealthFocus research shows that foods and beverages with GMOs are seen overwhelmingly as less healthy, less safe to eat and worse for the environment. 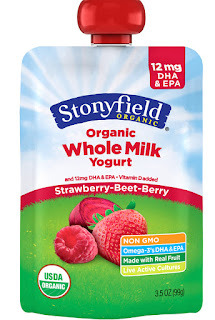 This is the opinion of consumers, which is why many mainstream yogurt manufacturers—as compared to organic processors, as organic, by definition is non-GMO—are seeking out non-GMO ingredients. It’s time for the yogurt conversation to include strong yogurt. This is yogurt made with simple, good-for-you ingredients that build strength for healthy aging.